Violent extremism: is religion the problem or the solution? Religion is widely blamed for much of the violence in our world, both today and in the past. Its defenders say that most so-called conflicts in the name of religion are in fact ethnic, nationalist and territorial, and they exploit religion for their own purposes. But, even if this is so, it still leaves the question of why religion is so easily exploited for violent ends. All religions declare that peace and reconciliation are their goals, yet all too often they appear to exacerbate conflicts. There are many reasons, but the work of sociologist Douglas Marshall is particularly helpful. He described religion in terms of belief, behaviour and belonging. My view is that different religions combine different degrees or emphases of these. The abuse of religion has often been related to the first two: belief and behaviour. It cannot be denied that, to religion’s shame, arguments over doctrine and even ritual have led to violent clashes. Even today they are used as a pretext for violence towards those who do not share the same beliefs and practices. However, when it comes to violence in the name of religion – especially in our modern world – it usually has far more to do with belonging. Identity affirms who we are, and at the same time who we are not. Whether distinctions and differences are viewed positively or negatively depends overwhelmingly on the context in which we find ourselves. In a context of real or perceived threat, or out of a sense of historical or current injury, we turn to our identities for fortitude and reassurance. But, all too often, this leads to a sense of self-righteousness and a tendency to disparage “the other”. In seeking to give meaning to who we are, religion is bound up with all the components of human identity. It thus plays a key role in providing a sense of value and purpose, especially where identities are threatened or disparaged. But, in doing so, religion can intensify that self-righteousness. The result is that opponents – or those who are different – are delegitimized and conflict is exacerbated, so betraying religions’ most sublime universal values. This tendency generates a mindset in which people see themselves as part of a community of the elect in violent conflict with those who do not share their worldview. Such an ideology can be powerfully attractive to those alienated from wider society, especially younger people seeking a sense of self-worth, or even prestige. While there are clearly times when physical violence must be tackled head on, such a step alone cannot contain the mentality that leads to it. The utmost must be done to drain the "swamp of alienation" – whether political, social or economic – in which violence breeds. No less critical is to highlight the voices of the overwhelming majority of religious institutions and authorities that repudiate such abuses of religion. Regrettably, the international media has been far more diligent in publicizing the abuses rather than the condemnations. In particular, we need to highlight where religions show respect for other communities and traditions, and have repudiated the extremist mindset. A notable example was last year’s Marrakech Declaration, rallying support throughout the Muslim world for the historical Charter of Medina, as a commitment to the values of citizenship and the civil rights of other religious communities. Another example of inter-religious collaboration is the King Abdullah International Centre for Inter-religious and Intercultural Dialogue (KAICIID) established by Saudi Arabia, Spain and Austria, supported by the Holy See, on whose board of directors I am privileged to serve. KAICIID has brought together major Muslim leaders from Iraq, Syria, Lebanon and elsewhere in the Arab world, with heads of minority communities in those countries – Christian, Kurd, Yazidi, Druze – under the rubric “combating violence in the name of religion”. It has developed networks of collaboration throughout the region, training religious leaders in dialogue and social media skills. The need to highlight inter-religious cooperation is of the greatest relevance in territorial conflicts that involve identities rooted in religious traditions. The Israeli-Palestinian conflict is a particular case in point. Those who have tried to resolve this conflict in the past have avoided religion and its representatives as much as possible. Perhaps this is understandable. But the idea that by avoiding religion one is more able to achieve a resolution is a fallacy. Failure to engage the peace-seeking religious mainstream only plays into the hands of extremists who wish precisely to transform this territorial conflict into a religious one. If we don’t want religion to be part of the problem, it must become part of the solution – not least by highlighting religious support for peace and inter-religious cooperation that can promote this goal. But things might be changing. When the Trump administration’s emissary to the Middle East, Jason Greenblatt, visited Jerusalem in March, hoping to initiate peace talks between Israel and Palestine, he made a point of seeking out Muslim, Jewish and Christian leaders for advice. 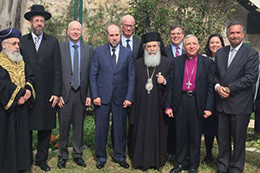 Amazingly, Greenblatt is the first personal emissary of any US president to meet the Council of the Religious Institutions of the Holy Land. The photo of this gathering was worth more than a thousand words, affirming a recognition that religion must be part of the solution to the conflict.